There is more focus on making these rooms into beautifully designed spaces where you can spend time relaxing, pampering, and unwinding. Your body will thank you. 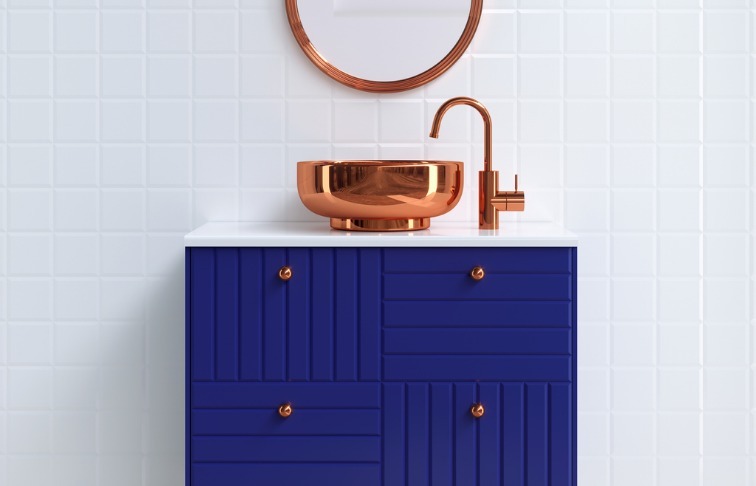 Here’s a look at the latest bathroom trends and products for 2019. 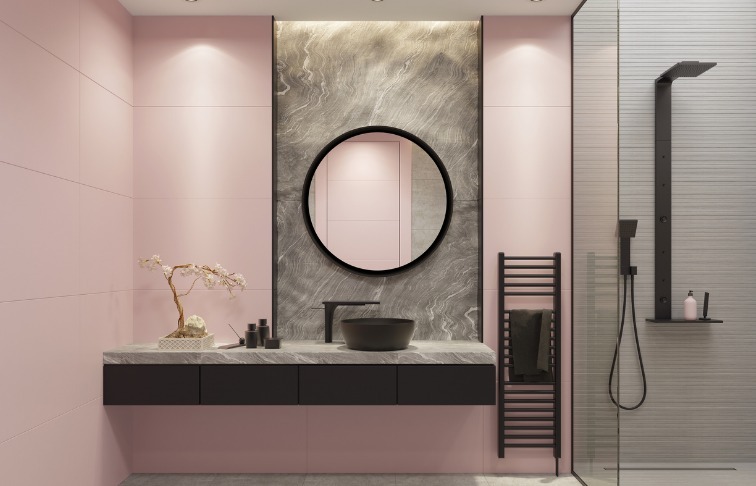 Watch for these bathroom trends to gain more popularity in 2019. 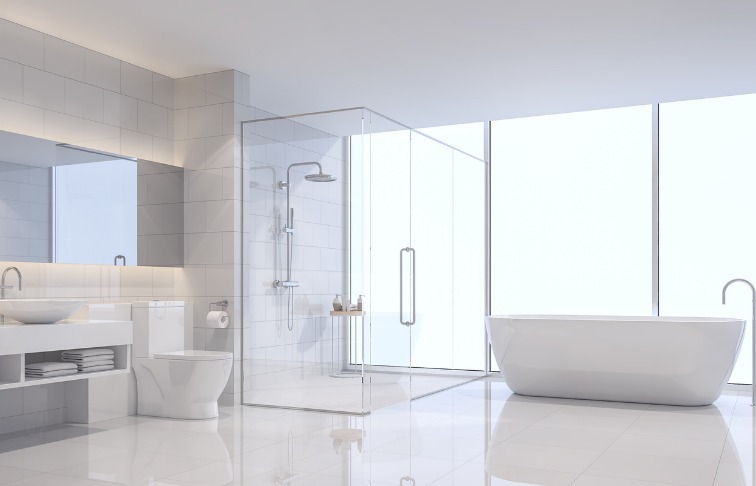 One trend that continues in new construction of luxury condos and modern homes is a more minimalist aesthetic, and this year bathrooms are more minimal than ever. Much like kitchens, these rooms are about clean design, light colors and natural tones. They act as an extension of the home’s architecture to make these rooms and the home feel larger. You’ll continue to see wider openings and walls replaced glass for a more open feel. There are more flat surfaces and sinks and shower floors designed at slight angles, forgoing the ugly drains. Some shower floors are so flat they don’t even appear different than the rest of the bathroom. Larger tiles and surfaces are more popular than smaller, busier designs. Terrazzo is making a large comeback, as are light tones of marble. There is more focus on the look of tubs and showers. When combined, they are sleeker and more attractive, and if separated they are each large enough to be comfortable, and attractive enough to be inviting. Tubs are free-floating, standing out prominently to evoke luxury and comfort. And the right fixtures finish the look. For softness in both look and texture, towels are stored openly similar to what you might see in a luxury spa. 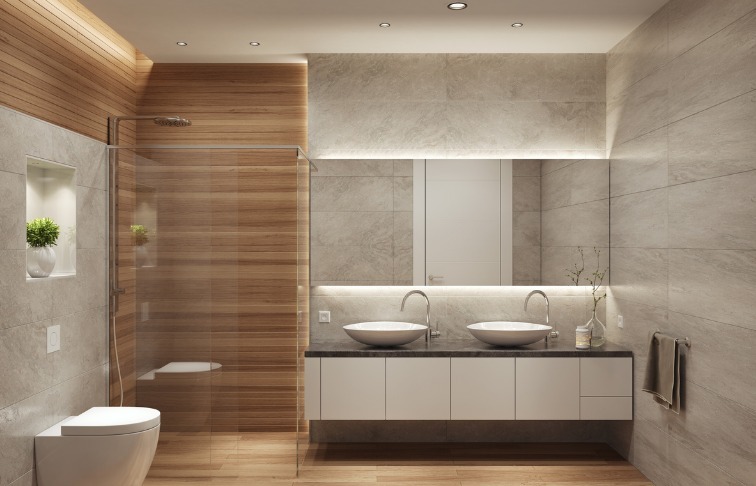 Bathrooms are becoming softer, cleaner, more sophisticated, and more inviting. New high-rises continue to use glass as the main exterior design element, and homes are adopting more floor-to-ceiling windows. Rather than hide behind privacy walls, bathrooms now use windows to your advantage. They provide commanding views of the surroundings. Unfortunately, they also provide commanding views of you, but technology such as automatic frosted glass and voice-activated drapery mean you can enjoy the view without minimal. Along with smart drapery, 2019 brings more technology to make your bathroom experience smarter. 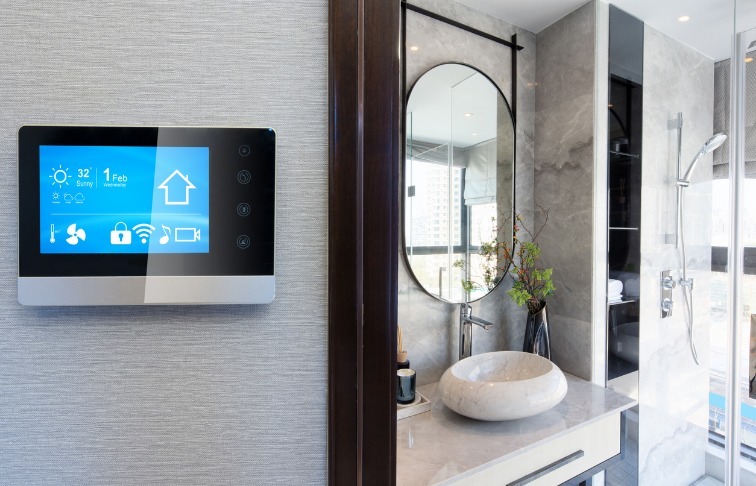 New advancements in IoT (the Internet of Things, or multiple devices connected together via WiFi) has resulted in many new products. One of the largest advancements is within the category of toilets. They can automatically open and close, flush, activate in-bowl deodorizers (thank you), emit warm water, blow air, heat their seats, and even clean themselves. You can talk with Alexa or Google Assistant, play music, and enjoy special light shows you didn’t know you needed. Other products are joining in. There are now smart fixtures that turn on by voice command, and mirrors that function as a tablet, allowing you to check the weather, order beauty products, and get beauty advice. Though some technologies may have you wondering if they are really necessary, the Alexa or Google Assistant addictions are real and it’s frankly hard to not take advantage of any technology that makes life easier. Expect more in the way of creature comforts from IoT. The trends toward cleaner, friendly color, and natural tones leave room for another trend to stand out, which is precisely what it wants. 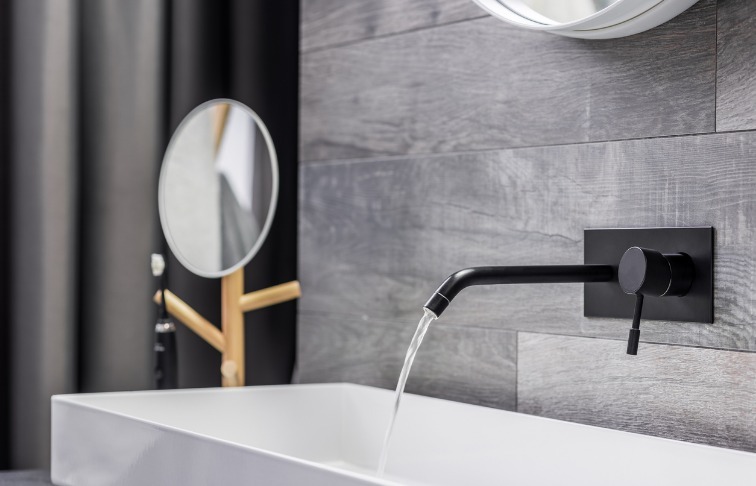 Black matte Is the newest look for bathroom fixtures. The color is also used as thin frames on mirrors and glass showers. With the soft and light colors in the rest of the bathroom, these items stand out beautifully and provide just the right amount of masculinity without the stigma. It’s just a touch, and just a touch is enough. If black isn’t to your cup of tea, you can take advantage of gold and brass. 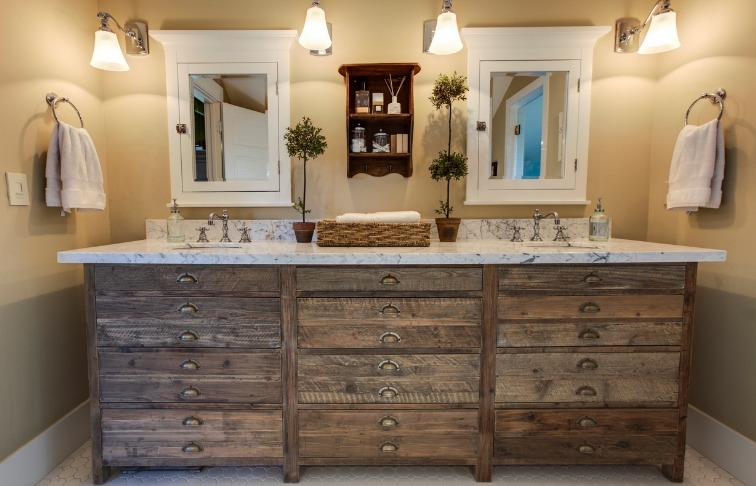 These materials are sometimes shown in all their glory on cabinets with minimal storage. Matching pipes create eye-catching intrigue when their functions follow forms. Trend 5: The ’80s are back…Again! As we move further into 2019, we are beginning to see more wall colors, fabric colors, and designs that are reminiscent of the 1980s. Having come from the aqua and sea foams of previous years, we are shifting toward complimentary colors such as pinks and deeper turquoise. The warm colors are an inviting way to bring warmth to a home and update a look. For the bold color enthusiasts, there are stronger colors in bright red, yellow, green, and blue. These 80’s throwbacks provide a renewed richness and contrasts and still works well with the current trends in fixtures of black, gold, and silver. One era of design that still has appeal, especially for the vintage at heart, is mid-century design. Now we are seeing the design trend extended into bathrooms. Cabinets and buffets are being used as counters topped with marble. What used to hold record players now holds sinks and plenty of bathroom accessories. These pieces bring rich and attractive solid wood when solid wood is becoming less common. Each piece is unique, creating individualized stories and intrigue for each room. If mid-century is not to your liking, this same concept works beautifully for any antique or traditional design. I should already be a member of this group. Is there a way to check. I joined years ago.